Have you ever received an email demanding personal information or you will have your account turned off? Or maybe the IRS needs your social security number or you will be audited? These are examples of potential phishing emails. Phishing is an Internet scam where an email is sent out instructing recipients to immediately provide their personal account information usually for the purpose of “updating your account” or to stop it from being “deleted.” These emails are designed to look like an official communication from a respectable source like an email service team, help desk, bank /credit card company, or even UWM. The link(s) in the phishing email do not go to the source stated in the message. It actually goes to a computer controlled by fraudsters. Once armed with this data, thieves can access your accounts to control your email, take out cash advances from your accounts or may attempt to steal your identity and setup fraudulent bank or credit card accounts in your name. Be suspicious of any email with urgent requests for personal financial information. Banks and credit card companies will not email you requesting this information. Never respond directly to unsolicited emails requesting your personal information. If you think it may be a legitimate request, contact your financial institution using the contact information on your billing statement. Do not forward the email and delete from your mailbox. Do not click on . zip or .exe attachments in emails if you are not expecting the attachment. Contact the sender via phone or separate email to confirm what the attachment contains. Please do not click on links in emails as the link may be an attempt to distribute viruses or malware. If you need to go to a web site, look up the official web site address and type it directly into the web address bar or call the institution directly. StaySafeOnline – A website dedicated to helping people understand cyber security. Their phishing page is full of useful information. Electronic Frontier Foundation: The website of an organization dedicated to push for better internet safety practices. 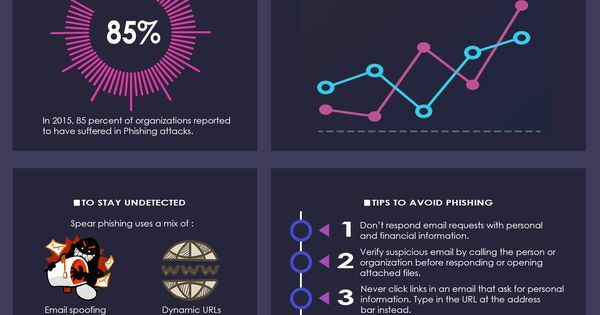 Their page on phishing has a few more tips for the advanced internet user as well as great tips on how to spot phishing emails. If you believe you have responded to a phishing email, please contact the Help Desk at 414-229-4040 or here.